Having young children shouldn’t stop you from traveling, and the process gets much easier with these travel-friendly bassinets! You can pack these up and take them with you to provide your baby with a comforting and familiar place to sleep while you’re on vacation, or even just when you’re at home! We’ve done our research to bring you only the best! But before we get started, here are some things you should know about before you shop! Mattress: Does it come with a mattress or mattress pad? Since bassinets are for younger infants, they usually don’t come with mattresses, but they have thin mattress pads to keep your child comfortable while they sleep. Stand: The stand will allow the bassinet to stand on its own without having to be placed on another surface or laid on the floor. 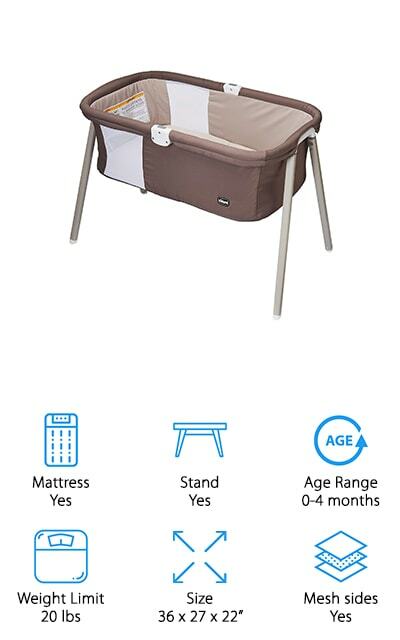 You can assemble the stand and set the bassinet up for a comfortable sleeping space. Age Range: This is the range of ages that can safely use the bassinet. Usually, this means that it isn’t safe for the child after they reach the maximum age or the weight limit, whichever comes first. Weight Limit: This is the maximum weight that can safely occupy the bassinet. This should be observed as a limit before age, so if your child reaches this weight you should discontinue use even before the age range ends. Size: The dimensions of the bed are important in case your child is longer than average – this will tell you how long the bassinet is as well as how much space it’s going to take up in your home. Mesh sides: The mesh sides on a bassinet will allow you to see your child and your child to see you. It also makes sure that there’s plenty of airflow in the bed, keeping it comfortable for your baby. Now that you know all there is to know before you start shopping, we can get to our bassinet reviews! We’ve looked through a ton of bassinets to make sure that we’re bringing you only the best products, so you can feel secure in your choice for you and your baby. Our top pick and budget pick are our best choices, so check them out first before moving on to the rest of the list! Our pick for the best baby bassinet for travel is the Dream On Me Karley. 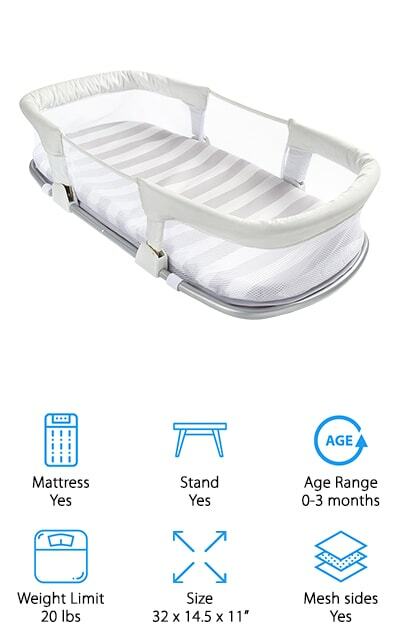 This snug portable bassinet is made of polyester foam, so it’s comfortable and lightweight. It folds up quickly to make taking it on the go that much easier. 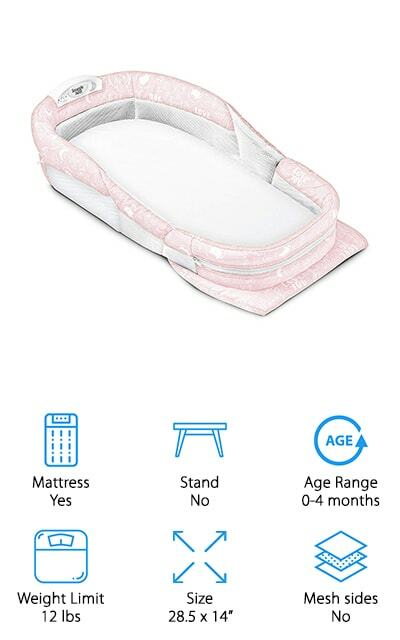 The mattress pad is a full inch thick so it’s nice and comfortable for baby to sleep on, and you can move it from room to room as well so they can sleep wherever you are. For infants up to 25 pounds, this bassinet is ideal! It’s got a double canopy which is nice for taking it outdoors and on planes, while it comes in quite a few colors, including aqua, light green, periwinkle blue, pink, and grey-and-pink. We love how portable and comfortable this bassinet is. It comes with a stand that makes putting it down wherever you are extremely easy, even when that area doesn’t have surfaces of its own. This great travel bassinet from BRICA has a great, well-thought-out design that will keep your baby safe and comfortable. 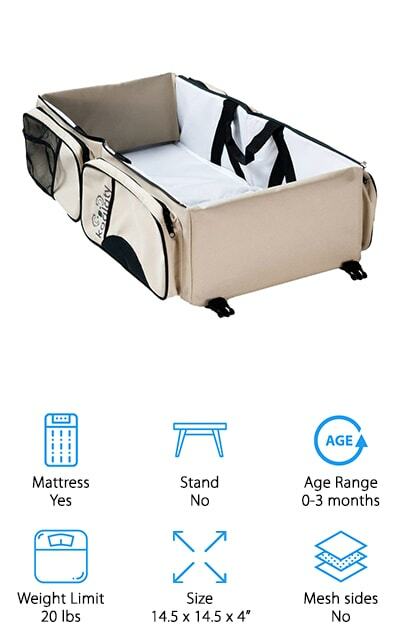 From birth to three months, you can use this comfortable and secure bassinet to move your baby from place to place, and also to use while you’re traveling. It locks down into shape for safety, and the frame of the actual bassinet itself is comprised of a steel tube frame that is durable and strong. The sides are mesh, so you can easily see your baby and there’s plenty of airflow so they don’t overheat. It’s extremely lightweight so you can use it on the go without worrying about a heavy product. We love the airflow and the fact that the bed itself is made of polyester, steel, and cotton, so it’s all great hypoallergenic blends and materials. It even comes with a carry handle! BRICA makes a great inexpensive portable bassinet that you’ll love! Lulyboo makes this super comfortable, lightweight bassinet lounge that’s perfectly customizable depending on your baby’s preferences. It comes with a removable canopy that is easy to attach and detach when you’re outside or on the go, as well as having a waterproof bottom so you can even use it while taking young children camping. It’s perfect for use as a co-sleeper as well as a travel bassinet and a changing station. It comes in three different colors: blue, pink, and beige. There’s also a toy bar with rattles and hanging mobile toys. What we love most about this baby bassinet, though, is the fact that it can turn into a backpack with almost no effort, which leaves your hands free for any of baby’s other things. The waterproof bottom really sticks out to us, because it’s really convenient to not have to worry where you’re going to put it down. Also, a bonus because it has no stand! 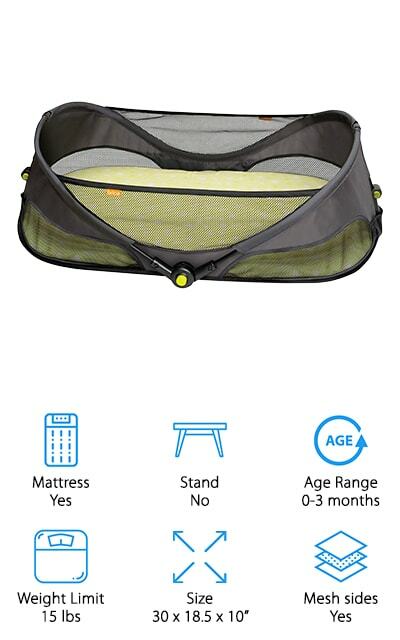 This portable bed from Chicco is a great bassinet for travel. It comes in two colors, chestnut, and lavender, which are usually outside the spectrum for baby accessories. We think that’s pretty awesome. Every bit of fabric on this bassinet is machine-washable, and they are easy to remove and replace once they are finished washing. 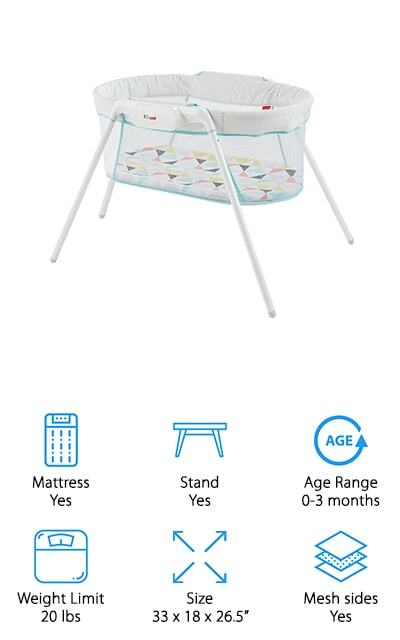 You can set it up very quickly because the top of the bassinet is a single piece and the legs snap on with no additional work. The mesh windows are comfortable and create air flow while still allowing you to see your baby while they’re snuggled up in their bassinet. It’s comfortable and soft, and you can use it just about anywhere in its matching carrying bag. From birth to four months, or whenever your baby starts pushing up, this is the perfect bassinet for vacations. 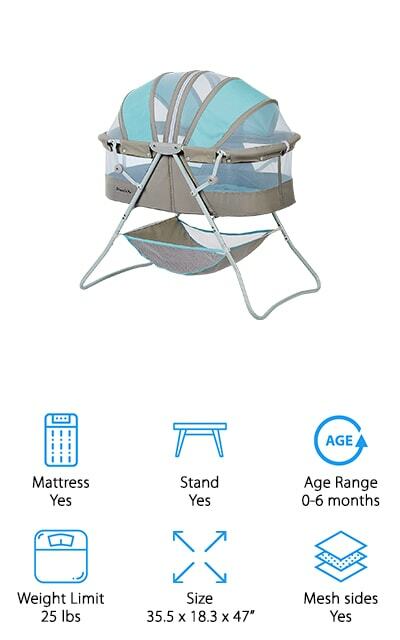 We love the unique colors, as well as portable and comfortable this bassinet is! The Snuggle Nest by Baby Delight is a great bassinet for use as a co-sleeper. Use it in your bed to keep baby safe and secure, and move it around with you when you’re going to be in another room and your baby needs to take a nap. What we love about this bassinet is that even though the walls are vented, they are rigid so it’s perfect for nervous parents who want to co-sleep with their young babies. It comes with a useful waterproof foam mattress, and nine different colors including special patterns like elephants, clouds, and feathers. Another neat feature is the sound and light unit, with a dim nightlight and access to womb sounds or a lullaby. This feature has a five-level volume control, and will automatically shut off after a certain amount of time. That’s great to ease your mind! And it folds up quick and easy as well for travel! The SwaddleMe Co-Sleeper is perfect for use as a travel bassinet as well. The mesh sides allow you to see your baby and circulate air within the bassinet so you don’t have to worry about them getting hot. It’s cozy and comfortable! Now you can place your baby next to you without any fear of anything happening to them while you sleep because they are comfortable and perfectly contained! The metal frame is sturdy and folds perfectly flat when you need to travel with it. Meanwhile, the sleeping surfaces and fabrics are comfortable and plus, so that your baby can sleep easily and securely! 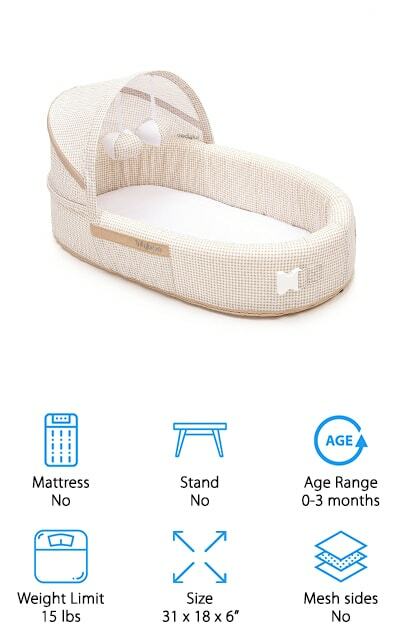 Use it until your baby is 3 months old or twenty pounds, whichever comes first, for a comfortable sleeping arrangement that will have you both sleeping easier! 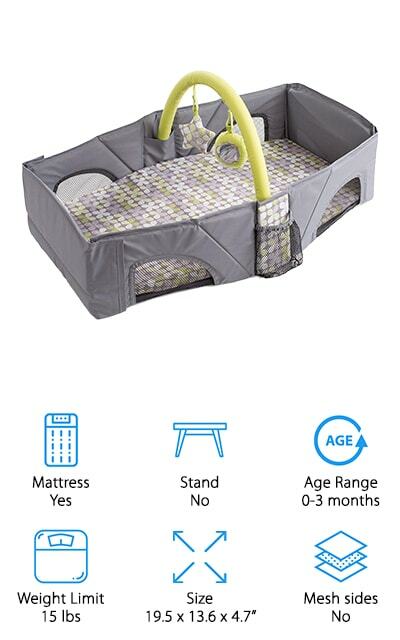 It can also help you make the transition to your baby sleeping in their own bed because it’s a convenient middle stage between bassinet and crib. The Summer Infant bassinet is one of the best bassinets for travel and at home. It comes with a detachable shoulder strap so you can carry it at the same time as other bags or luggage. It’s simple and effective! It comes with the mattress pad and a removable sheet, so you can throw it in the washing machine when it gets dirty. You don’t have to worry about staying on routine when you can take the routine with you! The front panel folds down so you can also use it as a changing pad. The sides all around are reinforced with cardboard for sturdiness. It’s waterproof so you can wipe it clean with a cloth if you’d like. You can even store other things in the bed, like diapers and cups, while you travel. It has so many uses! The mesh panels on the sides are safe and help make it more comfortable for your baby! Fisher-Price is one of the premier names in baby gear, and this Stow ‘n Go Bassinet is an excellent addition to their lineup. It’s comfortable for your baby, with a mattress pad and a cozy interior. One of the best things about it is the vibrations feature, which will soothe your baby into slumber if they’re fussy or don’t want to go to sleep. It’s great to take with you on vacations or even just to use around the house. You can easily take it apart and assemble it, and it fits perfectly in the easy-carry storage bag that comes with it. It’s great for use in the home and while you’re going to other locations as well because it’s lightweight and folds down to a smaller size. Give your baby something familiar and comforting! Comfy, flat sleeping surface for sweet dreams at home or on the go! We love the design and versatility of this amazing bassinet for travel. Ingenuity’s Fold-Away bed is a great airplane travel bassinet. You can easily attach the legs and assemble it in seconds, with a single step. This means that you can easily transport it from place to place as you need it, and when you’re at home you can store it easily! 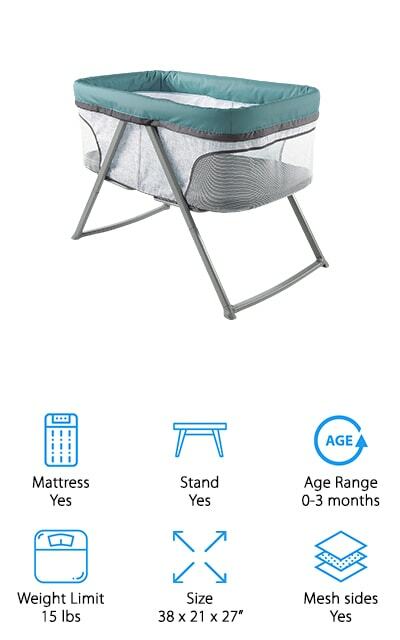 It has amazing mesh sides so you can keep an eye on your baby, and when the stand is engaged and put together it even has a rocking feature. You can soothe your baby right into a perfectly peaceful nap and then make it stationary when they finally fall asleep. Both of you can rest easy with this highly visible, comfortable bassinet. We especially love the colors and designs that it’s available in, such as Beaumont and Juniper. It’s beautiful and unique, and we’re sure that both you and your baby will love it! The rocking feature is especially unique and useful for fussy little ones. If you’re looking for the perfect airplane travel bassinet, this is the one for you! There are four zippered pockets in this perfect tote, so you can use it as a diaper bag, changing station, and a portable bassinet! It’s so incredibly versatile and you can use it for so many things! You can let your baby sleep anywhere, or carry all of their extra supplies with you. This makes it the perfect bed for traveling with you 0-3 month old. It’s both waterproof and washable, with carrying handles and super secure buckles! It even comes with a dispenser for disposable bags to keep used diapers in. We love how much this tote can hold, as well as how many different things you can use it for. You can carry your own diaper changing station and bassinet with you, and that’s pretty amazing. It’s spacious, lightweight, and perfect for travel! We absolutely love this bag, and we know you will too!